Penn State photo At 90, Jim Cartey continues to inspire art students enrolled in his water media course through OLLI at Penn State. UNIVERSITY PARK — Jim Cartey is an architect by profession and an artist at heart. After a career spanning 50 years, including working for renowned architect A. William Hajjar, he retired in 1986 from his position as a staff architect at Penn State. For the past 17 years, he has volunteered his time to teach a water media class for the Osher Lifelong Learning Institute at Penn State, never missing a semester. Cartey turned 90 years old in February. His students shared their awe of his accomplishments. “He’s so talented, so willing to take his talent and let it shine on other people,” said Gail Carty, an OLLI at Penn State student. Another OLLI student, Evelyn Rothgeb, shared her enthusiasm for the experience. “What is my favorite part of this class? The people, the learning, the teacher,” Rothgeb said. Student Anna Wieczorek went straight to the point with her review. 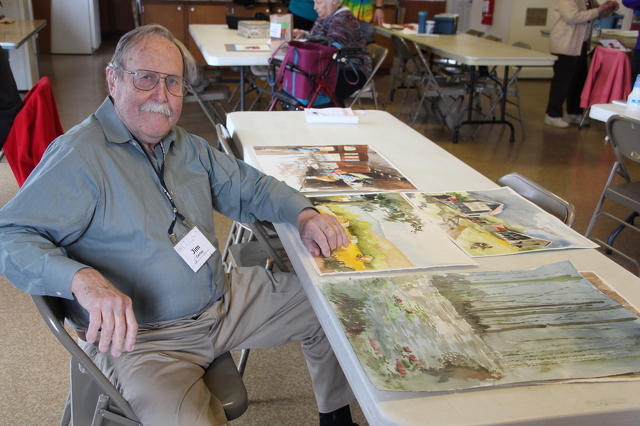 While Cartey talked humbly about his talent in class, Marie Doll, executive director of the Art Alliance of Central Pennsylvania, said he is a longtime member of the Art Alliance and his watercolors have appeared in many of their exhibitions over the years. Cartey stopped painting last year due to a tremor in his hand, but insisted that will not stop his dedication to inspiring others. He keeps the class lighthearted with his jovial spirit, but seriously persuasive with his words of advice. OLLI at Penn State is a membership organization offering affordable courses, trips and social activities geared toward adults who are 50 and older, but anyone over the age of 18 can participate. Course instructors are volunteers; many are Penn State professors, but others — like Cartey — are hobbyists or professionals who work with OLLI to create a class where they can share their talents with others. Sarah Anderson, director for OLLI at Penn State, shared her thoughts about Cartey and other volunteer instructors. “Jim is a quintessential OLLI instructor; he’s enthusiastic, talented, giving and kind. Lifelong learning is all about learning in a welcoming environment with no stress or expectations; learning for pure enjoyment,” Anderson said. OLLI at Penn State offers classes geared toward a variety of interests including art and dance, astronomy, entomology, politics, fitness, travel, financial planning, food, philosophy, technology and more. For more information, call (814) 867-4278 or visit OLLI at Penn State online.